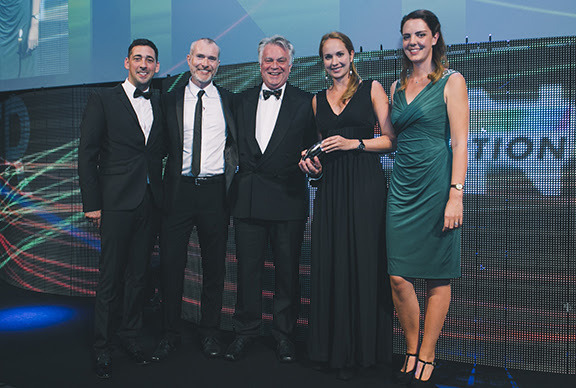 London, UK and Wels, Austria — Kraftwerk Living Technologies, international specialist in the field of audio-visual system integration headquartered in Wels, was honored with an AV Award in the category “Entertainment Venue of the Year” at the AV Awards ceremony held in London in late September. The record-breaking and award-winning project currently holding two Guinness World Records is the world’s largest 4D Theater and was designed and realized by the experts from Kraftwerk. The flagship attraction of the Chinese theme park Chimelong Ocean Kingdom in Zhuhai was opened in June of 2015 and seats a total of 1000 people – allowing for an hourly throughput of almost 3000 people. Nominated in the “Best Entertainment Venue of the Year” category, the 5D Castle Theater at Chimelong Ocean Kingdom was up against tough competition. Kraftwerk Living Technologies was announced the winner in front of over 1200 attendees. The AV Award was the third honor received for the 5D Castle Theater and followed an InAVation Award for “Most InAVative International Project” in February and an InstallAward as “Best Visitor Attraction Project” in June.